More durable than the standard version, better for MTB. Nor exclusively for MTB though, these can be used on the road of course and are still lightweight & aero. Good for most wet chilly conditions, except deep freezing winter. We stock the larger 2 of the 3 sizes (medium and large) and recommend going larger than your normal shoe size. We are also selling the short MTB ones & long standard ones on other listings in the shop. 6: Adjust around ankle, cleats and heel pad. 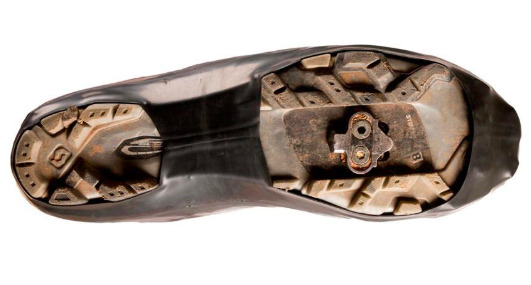 Ensure no part of shoe covers/overshoe are over cleats or heel pad. Note: Pull top of shoe cover over sock or under leg warmers. The top of the shoe cover needs to be against your skin or water may enter the shoe cover. 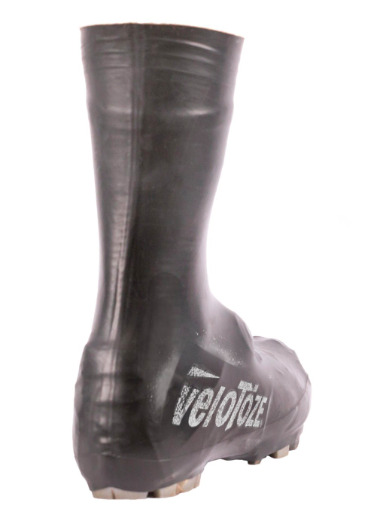 veloToze Short Shoe Covers - MTB are designed to protect your mountain bike shoes from rain, cold and mud. They are made with our signature waterproof material which we've reinforced for use on dirt and gravel trails. They are designed to accommodate bulkier mountain bike shoes and the cleat holes are cut specifically for mountain bike cleats. Whether you are racing, commuting, or just heading out for a ride, veloToze Long Shoe Covers - MTB will keep your feet dry, warm and comfortable. If you want any other specific products from the brands we list or have any other shop/paypal questions, contact us.